Get 1z0-052 demos for 642-583 when you ST0-29B with 100% success guaranteed. Our high quality 70-646 testlets prepares you well before appearing in the final exams of comptia 220-702 and switching study guide. 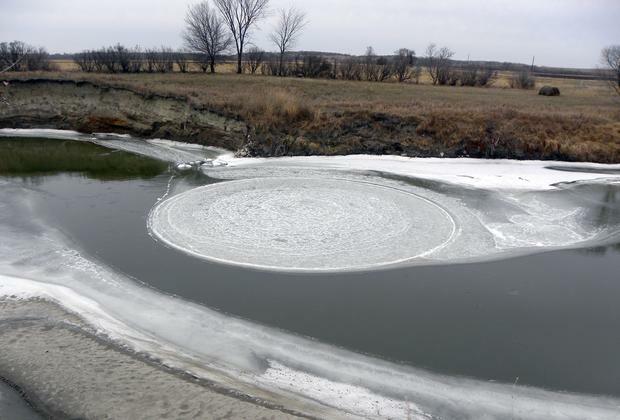 Unusual ice circle forms in North Dakota river; deemed unusually large for river's size. BISMARCK, N.D. (AP) -- When George Loegering saw a large spinning circle of ice in the Sheyenne River while out hunting with relatives, the retired engineer couldn't believe his eyes. "At first I thought, no way! It was surreal," Loegering, 73, said Tuesday of the large ice disk he witnessed Saturday. "You looked at it and you thought, how did it do that?" Then his engineering background kicked in. He calculated the disk's diameter to be about 55 feet, took photos and videos of it and then turned to the Internet for more information about what he, his brother-in-law and nephew had seen. "It's not an unknown phenomenon, but it is relatively rare," said Loegering, who lives in rural Casselton, about 20 miles west of Fargo. We've all heard aboyt crop circles that appear in the middle of corn or wheat fields. 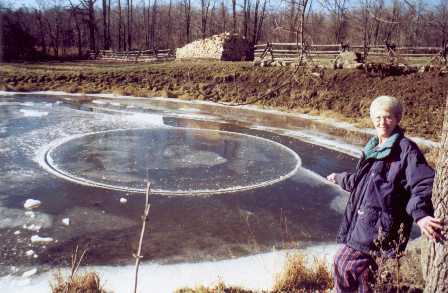 But here is a little known phenomenon -- ice circles! These perfectly circular formations have been recorded for some time now, usually appearing on rivers or small ponds, but occasionally also in the calm ocean waters on enoumous scales. We have no idea how they form, if they are natural or perhaps related to the same phenomenon as the crop circles. Here are a few images we have received. Your comments are welcome. Perhaps you can colve this mystery! 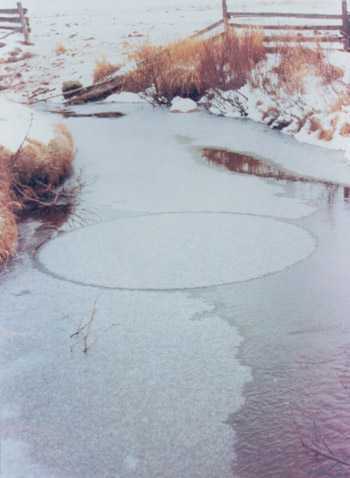 This circle appeared overnight in a small irrigation ditch in Delta, Ontario. Notice the appearance of a groove outlining the formation. The above two photos were taken of the same circular formation as it drifted down a river in Amasa, Michigan in 2006. Notice it is surrounded by liquid water. The edges look as if they were also carved but the origin of this formation is still a mystery. The above photo is from Norwalk, Connecticut in 2003. The formation was seen in a park. 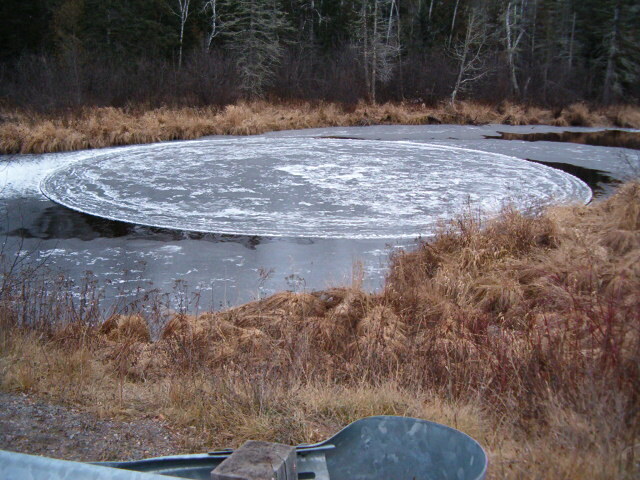 The surrounding ice was too thin for anyone to have walked on it and made the circle. 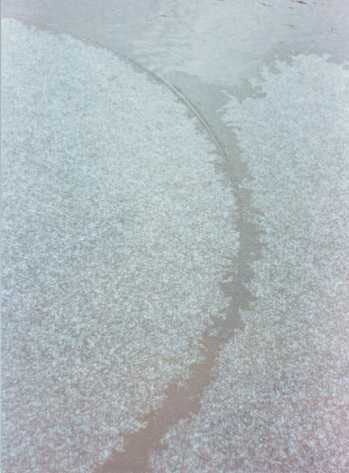 The formation above [left] is typical of smaller circles often seen on streams. In the detail photo [right] of the same circle we see how the edges appear to have been cut, yet no other signs or tracks nearby shed light on how this was done. These photos show a circle located in Northeast Utah. Again, it appears to have been cut but the fragile ice surrounding it shows no signs of human tracks. Back to Viewzone || Comments? When I was a kid, a little younger than now, we used to make circles like that. When we passed by a pond, lake or the fjord when it was just about to freeze, we could trow in a stone. The energi-wave spread and stopped as a highten and thicker ring as you see on the pictures. You can also see the air-bobbles trapped under the ice/slush when someone had trown in an object, and the air got trapped at impackt. To be able to make these rings the ice or water, or the snow fell on water, had to be just prior to freezing. Ice-needles had to be formed and the surface would be like a slush or sludge. When we passed by after a colder night the structure was frozen. It was sometime posible to make rings inside each other, or pattern of rings, by using more stones in one throw or after each other. One time we passed a lake with snow floating that was about to freeze. We threw in a stone and the extra energy from the wave passing out from the impact-point meltet the snow. The circle became clear. Then we threw some more stones. The circles, the impackt points, were clear dark ice. The rest of the lakes surface was white air-filled ice resulting from the frozen snow. We passed by at an exact right temperature, and we created a spoted ice.The rim, forms a thiker slush, that when it freeze will protect the circle for a while. A freelance media crew working for Discovery Channel visited the U.S. Army Corps of Engineers Engineer Research & Development Center's Cold Regions Research and Engineering Laboratory in Hanover, N.H., on March 26, to videotape and interview subject matter expert Leonard Zabilansky regarding the natural ice phenomena, ice circles. 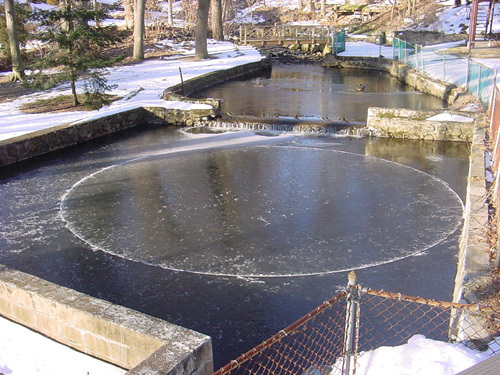 A race track flume was constructed in CRREL’s Research Area and the room was held at approximately 17 degrees Fahrenheit to simulate the natural environment conducive to the development of ice circles. 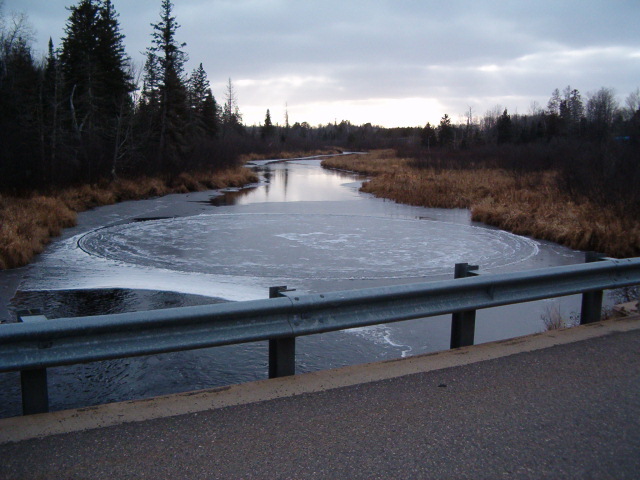 “In a river system groundwater inflow would regulate the formation of an ice circle. Whereas, in the model study the water was subfreezing,” said Zabilansky. To the best of our knowledge this process has not been modeled in a controlled environment.